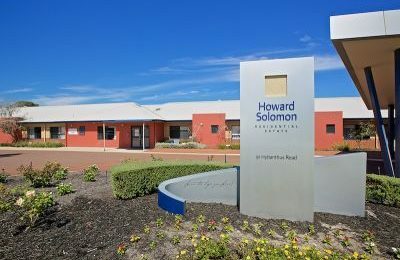 Howard Solomon Residential Estate is Masonic Care’s flagship residential aged care facility. The aged care facility has recently undergone a complete rebuild and transformation which was completed in 2014, resulting in the quality modern facility it is today. 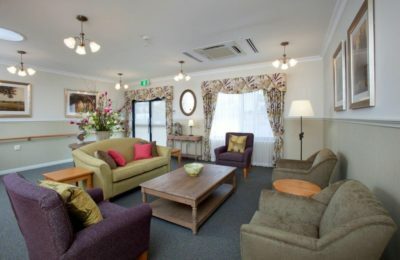 The newly rebuilt aged care facility consists of 126 private rooms with ensuites, several dining rooms, a variety of common areas and lounge spaces, a theatre room, a club room, a gym and a chapel. In addition there is a resident General Practitioner clinic, Physiotherapy and Occupational therapy rooms, an onsite hairdressing and beautician suite. Landscaped gardens, pergolas and outdoor spaces, as well as a children’s playground, add to the tranquil location. The facility is nestled next to Solomon’s Rise independent living village in Ferndale and forms part of a vibrant social community. Howard Solomon Residential Estate is Masonic Care WA’s newly completed aged care facility. All rooms have access to communal areas throughout the facility. These areas include lounges complete with high quality arm chairs, sofas, excellent entertainment facilities and floral arrangements. Dining rooms in each wing are fitted in restaurant style and glass doors from each lead to the beautifully maintained outdoor areas and gardens. There are several sitting areas located throughout the aged care facility complete with comfortable seating, books, magazines, and puzzle tables for residents to enjoy. Generously sized courtyards throughout the facility are light and airy, all outdoor areas and gardens are meticulously maintained and provide a beautiful, tranquil setting to enjoy the fresh air. All Residents have access to the exquisite non-denominational Chapel which holds services for varying faiths and beliefs. The Terrace Club consists of a large internal function area, which opens onto a generously sized external courtyard complete with a children’s playground for when the grandchildren or great grandchildren come to visit. Pergolas and an undercover Barbeque area provide excellent spaces for social activities or family occasions. The Retreat wing boast common areas furnished in quality and style. A lounge area complete with luxurious armchairs, lounges and occasional tables provides an excellent area for residents to enjoy the finer things in life. The large dining area, Solomon’s Restaurant, features stylish dining furniture & table settings. Tea and coffee is available in the restaurant throughout the day. Those rooms located within the Retreat offer access to the Leisure Club, which provides theatre style movie sessions and television viewing or a quiet private group activity area. Several small sitting nooks provide areas for small groups or individual residents to enjoy a quiet cup of tea or a book. All rooms also have access to the onsite GP Clinic, hairdressing salon, therapy rooms offering physiotherapy and occupational therapy as well as the Pamper Suite offering beautician services. The Retreat boasts common areas furnished in quality and style. A medium size lounge area complete with luxurious armchairs, sofas and occasional tables provides an excellent area for residents to enjoy the finer things in life. The large dining area, Solomon’s Restaurant features stylish dining furniture & table settings, a small kitchenette assists with the ease of meal service and provides easy access to tea and coffee making facilities throughout the day. The Leisure Club area features a large screen with an overhead projector, enabling theatre style movie sessions and television viewing, as well as a quiet private small group activity area for the Retreat residents. Several small sitting nooks provide areas for small groups or individual residents to enjoy a quiet cup of tea or a book. Quality aesthetic light fittings throughout provide comfortable lighting including natural light from skylights. There are disabled toilets close to all communal areas for residents convenience. The staff office is centrally located and easily accessible for residents and family members. The Retreat also features its own private outdoor pergola area. There are several generously sized courtyards throughout the facility which can be accessed via doors situated in common areas. All outdoor areas and gardens are meticulously maintained and provide a beautiful, tranquil setting to enjoy the fresh air. All Residents have access to the exquisite non denominational Chapel which holds services for all faiths, as well as the Terrace Club; a large communal internal activity/function area, which opens onto a large communal external courtyard complete with children’s playground. There is a large well appointed undercover BBQ area. All rooms also have access to the onsite GP Clinic, hairdresser, and therapy rooms offering physiotherapy and occupational therapy as well as the Pamper Suite offering Beautician services. The Retreat rooms are spaciously appointed with superior fixtures, fittings and plush quality furnishings. A generous ensuite is attached with high quality ceramic tiling and fittings. Each room has direct access to beautifully landscaped communal outdoor areas and gardens or direct access to a semi private courtyard area. The room contains a wall mounted flat screen television with built in DVD player. Each room has high quality carpets, with painted walls & ceilings which are meticulously maintained and styled in keeping with the surrounding communal areas. Each room features an electronic High/Low adjustable bed with a pressure relieving mattress, a large built in cupboard with full & half height hanging space, 3 large drawers & 2 smaller drawers plus a lockable drawer for safe storage of medications. The room also includes a bedside table containing three drawers, one of which is lockable for additional peace of mind, a large plush comfortable armchair, a convenient over bed table and fixtures for the hanging of pictures and memories throughout the room. All rooms have access to a staff alert system with call points in both the bedroom & the ensuite. A landline telephone connection can also be activated on request, with a large numbered cordless telephone handset. Access to outside is provided through a glass sliding door with window coverings including pelmets, sheer and fabric curtaining. All rooms have a paved area for a small outdoor table and chairs. The Strand rooms have access to communal areas which include a medium size lounge area complete with high quality arm chairs, lounges excellent entertainment facilities and floral arrangements, The Strand Bistro has a small kitchenette, dining furniture and large glass doors which open out into the meticulously maintained outdoor common areas. There are several sitting areas located throughout each area complete with comfortable seating, books, magazines and puzzle tables. Quality aesthetic light fittings throughout provide comfortable lighting including natural light from skylights. There are disabled toilets close to all communal areas. The staff office is centrally located and easily accessible for residents and family members. There are generously sized courtyards throughout the facility which can be accessed via doors situated in common areas. All outdoor areas and gardens are meticulously maintained and provide a beautiful, tranquil setting to enjoy the fresh air. All Residents have access to the exquisite non denominational Chapel which holds services for all faiths, as well as the Terrace Club; a large communal function area, which opens onto a large external courtyard complete with children’s playground. There is a large well appointed undercover BBQ area. All Residents have access to the onsite GP Clinic, hairdresser, and therapy rooms offering physiotherapy and occupational therapy. The Strand rooms are a spacious size with large private ensuite’s. All rooms have views to outside or garden views and are furnished with modern functional fixtures, fittings and furnishings. Each room is carpeted, with painted walls & ceilings which are meticulously maintained and styled in keeping with the surrounding communal areas. Each room features an electronic High/Low adjustable bed with a pressure relieving mattress, a large built in cupboard with full & half height hanging space, 3 large drawers & 2 smaller drawers plus a lockable drawer for safe storage of medications. The room also includes a bedside table containing three drawers, one of which is lockable for additional peace of mind, a large plush comfortable armchair, a convenient over bed table, a wall bracket for mounting a flat screen TV and fixtures for the hanging of pictures and memories throughout the room. All rooms have access to a staff alert system with call points in both the bedroom & the ensuite. A landline telephone connection can also be activated on request, with a large numbered telephone handset. Access to outside is provided through a glass sliding door with window coverings including pelmets, sheer and fabric curtaining. The Cove is a secured area designed specifically for people with Dementia. The Cove boasts a generous size lounge area complete with high quality armchairs, lounges and occasional tables, the Cove Cafe, a large dining room with attractive dining furniture adjoins the lounge area. A spacious secured courtyard with large pergola, outdoor furniture and immaculate gardens can be accessed via doors at the end of each corridor plus the glass doors off the Cove Cafe. There are various sized sitting areas located throughout the area complete with comfortable seating, books, magazines and other suitable features. All residents also have access to the onsite GP clinic, hairdresser and therapy rooms offering physiotherapy and occupational therapy as well as the Pamper Suite offering beautician services. The rooms are spacious sized rooms with large private ensuite’s and are furnished with modern functional fixtures, fittings and furnishings. Each room is carpeted, with painted walls & ceilings which are meticulously maintained and styled in keeping with the surrounding communal areas. Each room features an electronic high/low adjustable bed with a pressure relieving mattress, a large built in cupboard with full & half height hanging space, 3 large drawers & 2 smaller drawers plus a lockable drawer for safe storage of medications. The room also includes a bedside table containing three drawers, one of which is lockable for additional peace of mind, a large plush comfortable arm chair, a convenient over bed table, a wall bracket for mounting a flat screen TV and fixtures for the hanging of pictures and memories throughout the room. All rooms have access to a staff alert system with call points in both the bedroom and the ensuite. A landline telephone connection can also be activated on request, with a large numbered telephone hand set, window coverings including pelmets, sheer and fabric curtaining. The Terrace features direct access to the Terrace Club; a large dining, lounge & activity area, complete dining furniture, high quality arm chairs, lounges and excellent entertainment facilities. The Terrace Club opens onto a large external courtyard complete with two pergola areas, a children’s playground and a well appointed undercover BBQ area. ‘Fern’s on the Terrace’ dining area is also located in The Terrace. Fern’s is a large dining area with a small kitchenette, dining furniture and large glass doors which open out into the large external courtyard & pergola area. There are two additional small lounges located throughout the area complete with comfortable seating, books, magazines and puzzle tables. Quality aesthetic light fittings throughout provide comfortable lighting including natural light from skylights. There are disabled toilets close to the communal areas. The staff office is centrally located and easily accessible for residents and family members. There are generously sized courtyards accessible via doors situated in common areas. All outdoor areas and gardens are meticulously maintained and provide a beautiful, tranquil setting to enjoy the fresh air. All residents have easy access to the exquisite non denominational chapel which holds services for all faiths. 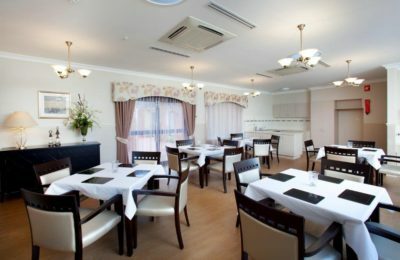 The Terrace rooms are a spacious size with large private ensuite and feature direct access to beautifully landscaped communal outdoor areas and gardens. They are furnished with modern functional fixtures, fittings and furnishings. Each room is carpeted, with painted walls & ceilings which are meticulously maintained and styled in keeping with the surrounding communal areas. Each room features an electronic high/low adjustable bed with a pressure relieving mattress, a large built in cupboard with full & half height hanging space, 3 large drawers & 2 smaller drawers plus a lockable drawer for safe storage of medications. The room also includes a bedside table containing three draws, one of which is lockable for additional peace of mind, a large plush comfortable arm chair, a convenient over bed table, a wall bracket for mounting a flat screen TV and fixtures for the hanging of pictures and memories throughout the room. All rooms have access to a staff alert system with call points in both the bedroom & the ensuite. A landline telephone connection can also be activated on request, with a large numbered telephone hand set. Access to outside is provided through a glass sliding door with window coverings including pelmets, sheer and fabric curtaining. A Refundable Accommodation Deposit (RAD), these deposits are the prices listed for each room type. A Daily Accommodation Payment (DAP). If paying the full refundable accommodation deposit (RAD) there are no daily accommodation Payments (DAP). If you choose a Strand Room with a price (RAD) of $495, 000, you may decide to pay half the price (RAD) of $247, 500 in one lump sum and make the other 50% up with a DAP. The DAP is calculated by using the maximum permissible interest rate per annum (MPIR) set by the Australian Government Department of Social Services. For this example the current (1st April 2019 onward) rate has been used of 5.96% per annum (MPIR). The daily accommodation payment (DAP) figure in this example would be $40.41. If you choose a Strand Room with a price (RAD) of $495, 000, you may want to pay no upfront refundable accommodation payment (RAD) and simply pay the daily accommodation payment (DAP). This payment will therefore be calculated on the full $495, 000. For this example the current (1st April 2019 onward) rate has been used of 5.96% per annum (MPIR). The daily accommodation payment (DAP) figure in this example would be $80.83. For further information about funding or for general enquiries please contact one of our friendly staff members who will be happy to assist you. Not Sure Where to Start with Aged Care?